Alcohol Drinking - A Concern in India? The recent Global Burden of Disease series by the World Health Organization, the World Bank and the Harvard University School of Public Health labels alcohol a leading cause of disability worldwide. It estimated that in 1990, 62 million people depended on alcohol, of whom nearly 7 million came from Central and Eastern Europe and the Newly Independent States of the Former Soviet Union (CEE-NIS). Others estimate that alcohol accounts for 5-10 percent of the disease burden and results in some 2 million deaths annually worldwide. Despite these alarming statistics, drinking and drink continue to be an integral part of the social elixir, globally. For centuries, alcohol has played a significant role in religion, medicine and culture. The Ancient Egyptians believed that beer was invented by the goddess Osiris for the "commoners" and that wine was reserved for aristocrats, religious ceremonies and medicinal purposes. In pre-Islamic Arabia, beer, fermented dates, milk and wine were commonly consumed until the advent of abstinence. Chicha (beer made from maize) played important religious, economic and political roles during the Incan empire, and drunkenness was largely associated with revelry and feasting throughout the Middle Ages. Even today, birthdays, holidays and religious events are typically celebrated with alcohol as a focal point, and moderate alcohol consumption is credited with reducing stress, producing euphoria and even enhancing certain cognitive performance. Alcoholism was not recognized as a major social problem probably until distilled beverages became available around 1100 AD, and its adverse nutritional consequences were first documented in 18th century England. Now, it is known that alcohol consumption often leads to addiction, increases the likelihood of virtually all types of injury and enhances the risk of nearly every leading cause of death throughout the world, including ischaemic heart disease, cardiovascular disease, various cancers and traffic accidents. A 1997 American Institute for Cancer Research report, Food, Nutrition and the Prevention of Cancer, puts the "average" alcohol consumption at a moderate 3 percent of total energy, or 9g of ethanol per person per day. Consumption, however, is subject t o underreporting and it varies regionally, nationally and culturally-with better documented evidence of higher consumption and related health and social problems in industrialized than in non-industrialized societies. The lowest consumption is recorded in low-income Asia, the Middle East and North Africa. The CEE-NIS region, on the other hand, has among the highest alcohol consumption rates worldwide. And now, there is a new, alarming trend--increased alcohol intake by women, youth and children, notably in the Czech Republic. Much of the increased consumption in CEE-NIS is attributed to economic uncertainty and unemployment linked to the transition to a market economy, loosening regulatory and social controls, an d increased availability through domestic "gray" and "black" markets as well as global alcohol producers who are discovering the newly opened markets in developing countries and the post-communist region, as alcohol consumption continues to fall in the West. With an estimated intake of 15 liters per capita of pure alcohol annually, Russia probably has the highest consumption rates in the world-and 25 percent of this is highly toxic, contaminated alcohol, not intended for human use. The per capita consumption is estimated at 13.5 liters in France, nine to 12 liters in Estonia, 9.4 liters and rising in the Czech Republic, and 7.2 liters in the United States. The health effects of alcohol consumption are generally dose-dependent. "Binge drinking," drinking a large amount of alcohol in a short period of time, appears to increase the risk of hemorrhagic stroke and is often correlated with motor vehicle crash es and alcohol poisonings. Police statistics implicate alcohol abuse in nearly 60 percent of violent deaths and in over 50 percent of fatal traffic accidents in Russia, in one out of every six traffic accidents in Hungary, in some 10,000 crashes and 2,00 0 traffic deaths in Poland in 1995, and in 30-80 percent of homicides and suicides in Hungary, Poland and Russia. Death from acute alcohol poisoning is generally rare. However in Russia and Estonia, deaths from acute poisoning increased three to five- fold between 1989 and 1993, causing nearly 30,000 deaths in Russia, compared with 200 to 400 such deaths in the United States, and 1,500 to 2,000 in Poland. Although epidemiological studies generally report that moderate alcohol consumption confers certain health benefits, policy makers who propose "moderation" do not recommend alcohol for those who habitually abstain, because alcohol may lead to addiction. In fact, chronic excessive alcohol intake is the most common consumption pattern in the CEE-NIS, and it is often blamed for the high rates of alcoholism in the region, which like consumption is also generally underreported. However, epidemiological surveys do indicate the magnitude of the problem. Such studies put the prevalence of habitual drunkenness in certain regions of Russia at approximately 20 percent. Excessive alcohol consumption is linked to excessive mortality. Russian demographer, A. Nemstov estimates that each additional liter of alcohol consumed above eight liters per capita per year is responsible for a 9.5- month loss in life expectancy in m en and a four-month loss in women in Russia. And, general morbidity among alcohol abusers is twice as high as among non-abusers because excess alcohol causes a range of adverse effects. Persistent heavy drinking may damage the liver, the digestive tract, and the central nervous and cardiovascular systems. (See chart) It decreases appetite, interferes with nutrient absorption, causes alcoholic gastritis, and ulcers-among other effects. Liver disease, especially in the presence of cirrhosis, is the leading cause of death among alcoholics and even mild consumption may induce liver disease. Yet, in Russia, only 5-7 percent of liver cirrhosis is officially reported as alcohol-related. Alcohol is increasingly linked to a high risk of breast and colorectal cancer, and it is a major risk factor for cancers of the oral cavity, especially in combination with smoking. In addition, chronic alcohol consumption is associated with high blood pres sure. Heavy drinking also poses an increased risk of cardiovascular disease, although light and moderate drinking are generally associated with a reduced risk-lower than that for abstainers in many societies. What can be done globally-especially in the CEE-NIS to counter excess alcohol consumption and to prevent and treat its manifold adverse consequences. Measures to date in the CEE-NIS lack conviction, consistency, and a "public health" dimension, and the y do not reflect the gravity of the problem. There is a critical need to: highlight the health-not the mere economic-impact of alcohol; develop and promote sound legislation and policy; disseminate reliable information; undertake public education campaigns; harmonize sectoral and group interests; build coalitions among governmental and non-governmental organizations; provide effective alcohol-related social services-for treatment as well as for prevention-and allocate adequate national resources and priority. Mikhail Gorbachev's 1985-1987 alcohol prevention campaign saved an estimated 1 million lives through 1993. The time is now. And the Russian Public Health Association (RPHA) has taken the first step to catalyze action against alcohol abuse in Russia, through its USAID-sponsored All-Russian Forum, Alcohol and Health in Russia, which took place September 1, 1996 - April 30, 1997 in Moscow. Ancient India was not a "dry" culture. Sanskrit literature is full of tales about numerous liquors and intoxicating beverages during Vedic and pre-Vedic times (circa 2000 B.C.). 'Soma'-an "exhilarating," though not necessarily intoxicating drink-was offered to gods during prayers and consumed by priests and proponents of sacrifice, whereas 'Sura' - a liquor distilled after the fermentation of barley and wild paddy-was considered capable of inebriation and condemned. North and South Indian literature contain numerous references to drinking by women to improve their "amorous disposition" and "rosy complexion"! Mainly three types of alcoholic drinks are available in present-day India: toddy (fresh or fermented sap of palm which contains less than 5 percent alcohol); arrack (distilled from molasses or jaggery and containing about 40 percent alcohol); and Indian-Made Foreign Liquor (IMFL), including beer, gin, whisky and rum. Toddy and arrack are inexpensive and are predominantly consumed by the masses. IMFL is more expensive and caters to the needs of middle- and upper-class society. A thriving illegal liquor industry in India manufactures and sells a crude, local distillate. Because of its low cost and high "kick," mostly poorer people, both urban and rural, consume this illicit substance. 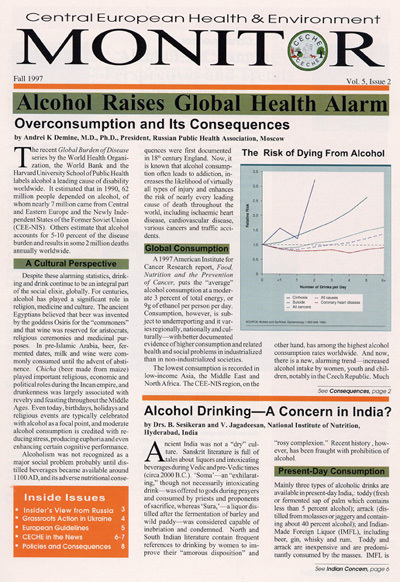 Present day alcohol consumption in India is not well documented. However, earlier statistics show that the most common beverage consumed by 73 percent of all those sampled in one survey in Punjab in the northern part of India is country liquor or home distilled alcohol in roughly equivalent amounts. In the urban areas, 6.2 percent of drinkers are estimated to exclusively consume distilled beverages such as IMFL. With changing economic scenarios, higher purchasing power and urban agglomeration, however, the consumption of IMFL in Andhra Pradesh (AP) has gone up three-fold and AP has the dubious distinction of being ranked first in the country in 1991 in arrack consumption with 111 million litres. Overall, a large majority-62 percent-of drinkers in India can be classified as light drinkers (i.e. social drinkers), 29 percent as moderate drinkers, and only about 9 percent as hard drinkers. Alcohol use appears to be higher among people 20-39 years of age. The clinical consequences of alcohol abuse in India matches that of Western populations. (See "Lead article".) Given serious health implications as well as negative religious connotations of alcohol use, prohibition has long been a rallying point for Indian politicians and social reformers. Mahatma Gandhi insisted on prohibition across the country, and the Indian Constitution and five-year plan programmes instituted this policy. In fact, the declaration in Article 47 of the Indian Constitution notes that "States shall endeavour to bring about prohibition of consumption of intoxicating drinks except for medicinal purposes." The revenue issues surrounding prohibition were glossed over initially; but the lure of lucre from liquor has proven to be irresistible. Liquor is a major source of income to the Indian government, and over time, commitment to prohibition as a cause h as dwindled. Now, all Indian states except Gujarat have lifted prohibition laws. However, concerns persist that the lifting of prohibition leads to increased production and availability of liquor and that this permissive access contributes to more crime , alcohol-related health problems, road accidents, loss of much needed income due to expenditures on alcohol and reduced productivity and life expectancy. It is against this backdrop of concern that village women in the state of Andhra Pradesh collectively launched an anti-liquor movement. This small cultural revolution has successfully battled the entrenched liquor lobbies to improve the wealth and health of households in the state. Literacy campaigns have succeeded in creating a new awareness among the downtrodden, eventually resulting in closure of arrack installations in the state. The situation in Andhra Pradesh signifies a bitter struggle between an anti-liquor lobby, consisting mainly of women, and an all-powerful government, with its eye on liquor revenue. To date, neither party is a clear winner. But the women of Andhra have pinned their hopes on education, enlightened public opinion and strengthened grassroots organizations to combat the lure and the negative consequences of alcoholism.